The terms “hurricane” and “typhoon” are regionally specific names for a strong “tropical cyclone”. A tropical cyclone is the generic term for a non-frontal synoptic scale low-pressure system over tropical or sub-tropical waters with organized convection (i.e. thunderstorm activity) and definite cyclonic surface wind circulation (Holland 1993). Is that a mouthfull or what? In the Northern Hemisphere the primary time of year for getting tropical cyclones is during the summer and autumn, typically late July through early October (though there are differences from basin to basin). The peak in summer/autumn is due to having all of the necessary ingredients become most favorable during this time of year: warm ocean waters (at least 26°C or 80°F), a tropical atmosphere that can quite easily kick off convection (i.e. thunderstorms), low vertical shear in the troposphere, and a substantial amount of large-scale spin available (either through the monsoon trough or easterly waves). In Baja Peninsula the official dates for Chubasco (hurricane) season are June 1 through October 31, with the highest probability of one occurring during August and September. 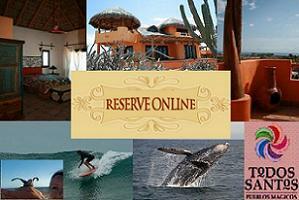 This season brings life-giving rain to Baja and Todos Santos. Thanks to the slightly cooler water temperature of Todos Santos, hurricanes are less likely to occur there than Cabo or La Paz. Rather than being hit by strong hurricanes Todos Santos experiences an increase in rainfall, especially in the mountains (so stay away from those dry arroyos (river beds)). However, very big waves can pound the coast during this time and if on the one hand they can cause damage to the coast and be very dangerous for swimmers, on the other hand they can be a great attraction for surfers from all over the world. Very rarely have hurricanes caused serious damage to Todos Santos. Streets get flooded and few roofs are damaged. Utility services are usually reconnected (if lost at all) within 1-3 days. It’s always a good idea to keep some extra water and food stored as well as a flash light and enough batteries during this time.